Ancient technical texts are very hard to work with. Not merely do you need the usual Greek and Latin language skills, and a feel for the customs of the ancient world. You also need a specialised understanding of the discipline in question. Not many of us have knowledge of alchemy, or farming methods, or architecture. So the manuals on these subjects tend to be understudied and few are translated into modern languages. I’ve written a couple of posts about Project Hindsight. This is a project undertaken by people interested in astrology in modern times, but consists of translations of ancient astrological texts. Such an enterprise can only be valuable, and the collection of translations deserves to be more widely known. Most are out-of-print but can be obtained as PDFs. But this week I learned that the principal translator, Robert H. Schmidt, has died. He was only 67. He was an independent scholar, and he did the sort of things we do here, so it is very much appropriate for us to commemorate him. He dedicated his life to ancient astrology, and especially hellenistic astrology; to understand what it was, and translating the primary sources so that others could work. In most cases he prepared the first ever translation of the sources into a modern language. He self-published his translations, which inevitably means that they did not find their way into academic research libraries. This is unfortunate, and it means that they remain obscure. The funeral home has a web-page with an obituary here, written by Bill Johnston, who also supplied me with some additional information. Born on December 22, 1950, Robert H. Schmidt obtained a scholarship to study mathematical physics at M.I.T. But he chose instead to go to St John’s College in Annapolis as part of their “Great Books” programme to read philosophy. There he was a student of Jacob Klein, one of Heidegger’s students. But he also learned the importance of reading primary texts in the original language and “discovered his love of the Greek verb”. Instead of pursuing an academic career, he chose to become an independent scholar, and to translate ancient astrological texts. He settled in Cumberland, in Maryland. To support himself he initially worked as a printer, and in a range of other blue-collar jobs, but by middle age he was well-enough known to support himself through his publications and recordings of lectures and seminars – presumably on the subject of astrology, although Mr Johnston does not say so. A draft of one of his papers, The Problem of Astrology (2000), may be found online here. It repays reading by those seeking to understand what he did intellectually. At one point he says something which perhaps explains how a university-trained philosopher came to be interested in astrology. He asks what we actually mean by the word “astrology”? Why the title “Metaphysics of Metaphysics?” [as a description of astrology] Now I chose that title very deliberately because, in my mind, metaphysics has two completely different meanings. My background being in the study of ancient and modern philosophy, when I heard the word metaphysics, I always understood it to mean the study of Being, as it was for the Greeks. It was a great surprise to me when I first went into a bookstore and looked for the metaphysical section expecting to find some new books on Aristotle, and found instead books on crystals, out-of-body experiences, meditation, occultism, and astrology. This was long before I was involved in the astrological world, by the way. … There is a statement by a Neo-Platonist philosopher named Iamblichus in a strange book called On The Mysteries. In this book another neo-Platonist Porphyry is directing a number of questions about the Egyptian religion to an Egyptian priest. In the course of the answering of these questions the priest says that the men who translated the Egyptian sacred writings into Greek — and these sacred writings included the their magical, alchemical, and astrological writings, all generally attributed to one of their sages names Hermes — the men who translated these sacred writings into Greek were men who were trained in Greek philosophy, presumably the philosophies of the Athenian Greeks Plato, Aristotle, and the Stoics. Now, this is a very astonishing statement and it made a great impression on me. Such are the chances of life. Another article is here. More materials can be found on his website, Project Hindsight. A GoFundMe site has been set up on Ellen’s behalf to help with medical bills and funeral expenses at https://www.gofundme.com/support-robert-schmidt039s-medical-costs. We would like to give our sincere thanks to the many people who have contributed so far, and for the outpouring of condolences and expressions of appreciation for Bob and his invaluable contributions to the art and science of astrology through his remarkable research over the last two decades. Few of us would find it possible to read an ancient astrological text with any enjoyment. Yet he evidently did. Most people who read such a text would find themselves baffled by the technical language. But he was not baffled. I do not myself possess any overview of the subject of Hellenistic Astrology; and evidently Mr Schmidt found the same, for he composed one. He made all these translations, and did so from hard, granite-like material in Greek and Latin. The world owes him a debt for so doing. Few professional academics have ever even attempted such a thing. He did not receive recognition or honour for what he did. But I suspect that little that has been written on astrology in the universities in the last 30 years will be half as useful or well-informed as his little series of self-published books. Thank you, Mr Schmidt, for all your efforts. You sought truth in the heavens. May you find mercy and the real source of all heavenly truth on the Last Day. Requiescat in pace. Back in 2010-11, I became aware of Project Hindsight, a series of privately published English translations by Robert H. Schmidt of ancient astrological texts. These are draft translations, coming out of the modern astrology community. But it is unlikely that anybody will ever translate these highly technical texts, and copies are very hard to find. For some reason today I started thinking of Antiochus of Athens, and then found myself wondering whether I ever acquired copies of this collection. In fact, I find, I acquired the volumes containing Antiochus and Hephaestio. Today I wrote and enquired about getting copies of all the rest, except for those with Vettius Valens and Ptolemy. We shall see what they say. I wish I could get copies of all these into a major research library or two. UPDATE: 5th Oct. 2018. I wrote to order five of these, and I learn that the paper copies are out of print. However PDF versions can still be purchased of the entire library at $25 each. There is a discount for several volumes. The entire set can be purchased for $225. I’ve just purchased 6 volumes. After all, who knows when anybody will translate astrological texts again? VOL. I: PAULUS ALEXANDRINUS. INTRODUCTION TO ASTROLOGY. (Complete). 378 A.D. Composed as an introduction for his son, and representing the main line of the tradition, it is the best way to get an overview of the major themes and concepts of Hellenistic astrology. It exhibits considerable sensitivity to the subtleties of the astrological language. VOL. IIa: ANONYMOUS OF 379. ON THE FIXED STARS. A substantial chunk survives of this ambitious treatise, including elaborate natal delineations for 30 fixed stars when on the angles and when configured with the planets. The only work of its kind. VOL. IIb: ANTIOCHUS OF ATHENS. FRAGMENTS FROM HIS THESAURUS. 2nd century A.D. The best source for the definition and clarification of specialized astrological terminology taken for granted by Ptolemy and others. VOL. III: PTOLEMY. PHASES OF THE FIXED STARS. Circa 150 A.D. Astrological weather prediction based on heliacal risings & settings of 30 fixed stars, showing evidence of having been excised from the Almagest–perhaps censored? Complete calendar of predictions for every day of the Alexandrian year. Hints at the broader philosophical importance of the phasis concept. VOL. IV: VETTIUS VALENS. ANTHOLOGY, Bk I. 160 A. D. The most definitive compendium of antiquity containing a critical assessment of the astrological thought of Valens’ predecessors, thereby preserving much ancient astrology for posterity. Notable for its highly personal style and its emphasis on experience rather than theory alone. Book 1 contains extensive treatments of the nature and effects of the planets singly, two by two, and three by three. Similarly complete treatments of the 12 signs, and many other matters. VOL. V: PTOLEMY. TETRABIBLOS, Bk I. Circa 150 A.D. A marvel of literary architecture, badly in need of a new translation. Book I first argues eloquently for the possibility and usefulness of astrology, and then presents Ptolemy’s “scientific” framework for astrology within the context of Aristotelean natural philosophy. Deals with the special natures of the planets, signs, and configurations. Derives the dignities with reference to a tropical zodiac. VOL. VI: HEPHAESTIO OF THEBES. COMPENDIUM, Bk I. 380 A.D. Treats of general principles of astrology & universal astrology, blending Ptolemy with Dorotheus and others. Highly interesting delineations of the decans. Also contains a very long excerpt from Nechepso/Petosiris on detailed eclipse delineation. Preserves an ancient Egyptian method of prediction using the Dog-Star alone. VOL. VII: VETTIUS VALENS. ANTHOLOGY, Bk II. On the general subject of happiness and good fortune. Rough trimester predictions based on trigon rulers. Houses, Lots, and a derived house system reckoned not from the Ascendant but from the Lot of Fortune, with emphasis on the Place of Acquisition. Aspect delineation. Numerous other subjects. All illustrated with many sample charts. VOL. VIII: VETTIUS VALENS. ANTHOLOGY, Bk III. On the general subject of length of life. The method of primary directions. The bound ruler. The combination of ascensional times with planetary periods. Prenatal new and full moons. Numerous examples of these life expectancy calculations. A large amount of dense but suggestive material on numerous alternative traditions. VOL. IX: TEACHINGS ON TRANSITS. The four surviving Greek texts on transit delineation, attributed to Dorotheus, Orpheus, Anubio, and Valens. Some highly unexpected delineations suggest a different underlying principle. Indications as to the context in which transits were employed, and when they were to be taken into account. VOL. X: THE ASTROLOGICAL RECORD OF THE EARLY SAGES IN GREEK. All the material found in the CCAG from astrologers who preceded Dorotheus, Valens, and Ptolemy or who seem to be independent of them. Hermes, Nechepso/Petosiris, Critodemus, “Zoroaster”, “Pythagoras”, Timaeus, Thrasyllus, Balbillus, & numerous others are represented. Most of it is katarchic or inceptional astrology. VOL. XI: VETTIUS VALENS. ANTHOLOGY, Bk IV. More on aphesis. Distribution of times. The Lot of Fortune and times of life. Transferral and Reception of chronocratorship. “Assignments” of planets to planets. Much more miscellaneous lore and the usual complement of examples. VOL. XII: PTOLEMY. TETRABIBLOS, Bk III. Genethliacal astrology and predictions for the characteristic events in human life, mainly using Ptolemy’s preferred method of planetary significators. Contains the notoriously obscure treatment of primary directions and length of life. The translator’s preface contains an analysis of house division, planetary strenght, and cusps in Hellenistic astrology. VOL. XIII: VETTIUS VALENS. ANTHOLOGY, Bks V & VI. Eclipses, Inceptions, and the “Climacteric Year”. Place of accusation. More on releasings of the years. Keys to using profections. Some electional material. Philosophical digression on the nature of prognostication and training of the soul. VOL. XIV: PTOLEMY. TETRABIBLOS, Bk IV. Completes the treatment of natal astrology begun in Bk III. Covers the topics of possessions, rank and eminence, work, marriage and sexual union, children, friends and enemies, travel abroad, and quality of death, and ends with a treatment of Ptolemy’s preferred system and hierarchy of time-lords.The translator’s preface contains a discussion of sect and related rejoicing conditions in Hellenistic astrology. VOL. XV: HEPHAISTIO OF THEBES. COMPENDIUM, Bk II. 380 A.D. Deals with “topics”, or special subject areas in the native’s life. Contains an extensive summary of procedures for rectification and the study of the conception chart, a commentary on Ptolemy’s treatment of length of life, a discussion of the time-lord method later called decennials accompanied by fairly elaborate delineations of planet pairs, a treatment of rank and honor with three chart examples including one that is the most elaborate and detailed surviving Hellenistic chart reading, plus a great deal of miscellaneous astrological lore. Much of this material is found in no other Hellenistic source. VETTIUS VALENS. ANTHOLOGY, Bk VII. Contains the only surviving intact presentation of an important timing procedure that derives directly from the earliest stratum of Hellenistic astrology, employing the periods of the planets and the ascentional times of the zoidia for the direct timing of planetary figures and configurations in a given nativity. Includes a method for investigating life expectancy based on a study of the domicile lord of the Ascendant in tandem with the domicile lord of the Lot of Fortune, supplemented with a study of the conjoinings of the Moon to other planets and a procedure for determining a succession of planets that have primary authority over the native’s successes and failures in all areas of life. PROJECT HINDSIGHT COMPANION TO THE GREEK TRACK. Some statements of method from Hellenistic astrology on how to read a chart, a glossary of Greek astrological terms, a list of the primary astrologers from Hellenistic times through the early Byzantine period, plus a collection of useful tables. 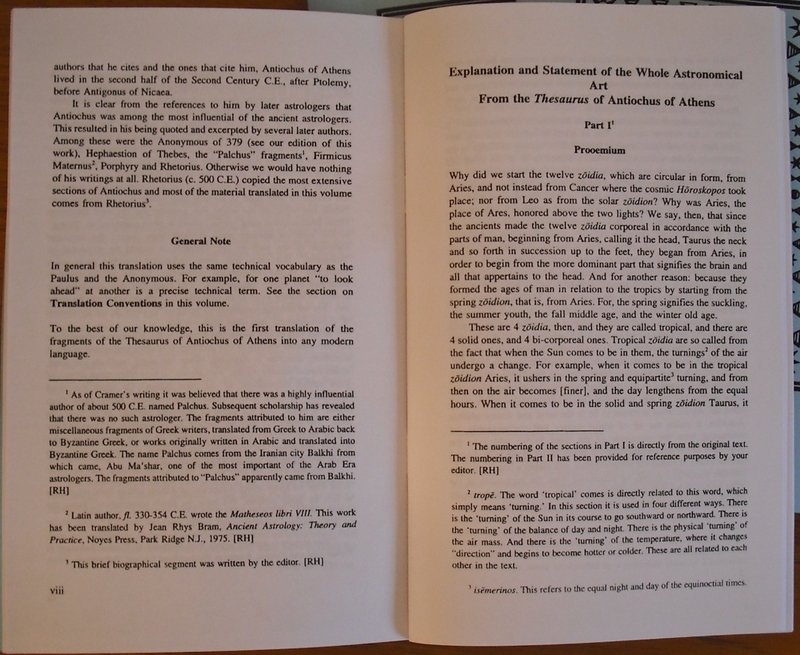 Anthony Alcock has sent in a translation of a curious anonymous Greek text in 8 chapters, concerning the Apotelemata (Talismans) of Apollonius of Tyana. The content is astrological, concerned with names and words. The work appears in medieval Greek astrological manuscripts, but also in a Syriac version as an appendix to the gnostic apocryphal Testament of Adam, itself perhaps dating from the 2-5th centuries AD. There are also Armenian versions of part of it, themselves clearly translated from an unknown Arabic text. A Greek text was printed with Latin translation by Francois Nau in the Patrologia Syriaca 1, pp. 1362-1425, back in 1907, and another by Franz Boll in Codicum Astrologorum Graecorum 7: Codices Germanici, p.174-181, in 1908. I was able to find some discussion of this work in an article by Christopher P. Jones, “Apollonius of Tyana in Late Antiquity”, in: S.F. Johnson, Greek Literature in Late Antiquity: Dynamism, Didacticism, Classicism, 2016, p.57 f. The article is online here. The writer reveals his Christianity at every point, both in his subject-matter and in his choice of words. He thinks that Apollonius was born early enough to predict the birth of Christ, and even (if the obvious interpretation is correct) that he founded a church in Tyana. As for language, ναός denoting a Christian church is ﬁrst apparently found in Eusebius, and προσκυνητός seems almost entirely a Christian usage. For στοιχειόω in the sense of ‘enchant’, ‘perform talismanic operations upon’, Sophocles’ Greek Lexicon of the Roman and Byzantine Periods cites no example before Theophanes Continuatus (not earlier than the ninth century). A span of 800–1200 is presumably about right for the composition of the work. It may be relevant that Tyana was an episcopal see as early as 325, and after being lost to the Arabs was recovered for the Byzantine empire in the tenth century; the site has also produced remains of a church datable to that same century. Though irrelevant to Apollonius’ fortunes in late antiquity, therefore, the treatise shows the same acceptance of him into Byzantine Christianity that is implied inter alia by his appearance in art as a prophet of Christ. Thank you, Dr Alcock, for making this interesting text more widely accessible. I’m not really all that interested in ancient astrological texts. What I am very interested in, tho, is that we should have access to ancient literature, whatever it may be. And it’s really quite hard to access to stuff when you don’t know it exists! The technical works of antiquity are just as much part of the heritage we receive as the literary works of history or biography or philosophy or theology. Indeed in some ways they are more significant. It was the technical works that the Moslems had translated into Arabic by their Christian servants such as Hunain ibn Ishaq in Baghdad in the 10th century. It was these same works that naturally made their way to Spain, and so into Latin during the middle ages. A textbook on how to do medicine, how to build walls, how to do military tactics, how to divine the future — this is hard knowledge of a kind that even a barbarous age can respect. I’ve been reading a 1977 article by David Pingree entitled Antiochus and Rhetorius. It highlights some of the peculiar features of the transmission of technical works. Such works are peculiarly liable to acquire additions, subtractions, and revisions. There is a simple reason for this. You go to Tacitus to read about the history of the first century. But you go to Antiochus of Athens because you want to draw up a horoscope. And if you find Antiochus’ work is a bit unsatisfactory in some respect, you’re quite liable to write notes in the margin of your copy, or to produce a shortened version of the useful bits, or whatever. You don’t care so much about Antiochus. It’s what he has to say that matters. You’re only interested in whether the book helps you do that horoscope or not. Pingree starts by referring us to Franz Cumont, a man who did more for the weirder stuff than almost any other. Apparently in 1934 he wrote a paper on Antiochus d’Athenes et Porphyre, AIPhO 2 (1934): 135-56. (Wonder what “AIPhO” is!) Cumont reckoned that Antiochus lived between 100 BC and 50 AD, and might be the same as Antiochus of Ascalon, although Pingree points out that Cicero and the others who talk about the latter never suggest he was an astrologer. Antiochus apparently wrote two major works on astrology: an Isagogika known to us from Epitome I (see the discussion on pp. 205-6) and from the (unacknowledged) plagiarisms in Porphyrius’ Isagoge, and a Thesaurus which was one of the sources of Epitome II, from which are derived Epitome IIa and the first part of Epitome III. From Epitome III are derived Epitomes IIb, IIIa, IIIb, and IIIc; and Epitome IV drew upon the same source that was used in the latter half of Epitome III. Of all these epitomes only Epitome IIb bears the name of Rhetorius, but scholars have generally associated his name with all of the works mentioned above except for Epitome I. The object of this paper is to eliminate the confusion that has been created regarding Antiochus and Rhetorius, and to establish a program for editing Rhetorius that may seem unusual to a classicist, but that is necessary in the editing of Greek astrological texts. 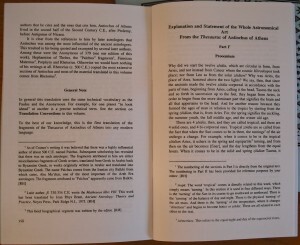 The manuscripts cannot be relied on to preserve the original compositions of ancient authors; Ptolemy’s Apotelesmatika is virtually the only such text that seems to have survived relatively unscathed by the “improvements” of scribes, though the variant readings of Hephaestio of Thebes and of “Proclus” indicate that even its text is not completely pure. It is of the utmost importance for understanding the history of the transmission of the texts and the history of Byzantine scholarship in astrology that the various epitomes of each work be carefully distinguished and separately edited. This is interesting, not least because it has not happened. Traditions that involve this sort of complexity tend to deter editors. Pingree suggests that these indicate that Antiochus is probably after Ptolemy, then, although I don’t quite see the logic. He also mentions the Anonymous of 379 which refers to Antiochus, together with Vettius Valens, Antigonus and Heraiscus as writing on the power of the fixed stars. In addition Firmicus Maternus, writing in the mid-4th century in his Mathesis II 29:2, quotes Ptolemy and Antiochus. From this he concludes that Antiochus wrote in the second half of the second century. The logic, evidently, is that Ptolemy has to be before, while Porphyry, ca. 300, must be after. This does not seem very firmly established to me. He then adds that Antiochus, in the Isagogika, references Hermes, Timaeus and Nechepso-Petosiris as authorities. The citations from Hermes look like the sort of thing that Dorotheus of Sidon was coming out with in the mid first century BC, while Nechepso-Petosiris he has already dated as early first century. No contradiction there, as Pingree remarks — but surely these all suggest an earlier date than 150-200 AD? Interestingly Antiochus is used as an authority in Arabic astrological texts from the 9th century on, together with Dorotheus and Vettius Valens; a combination of authors already found in a 6th century source used in epitome III, which itself was used for epitome IV. Pingree infers that the 6th century source was translated into Arabic. An edition of Antiochus need include only Epitomes I, II, and IIa, together with the fragments in Arabic. The remainder he ascribes to Rhetorius. “Epitome I” contains the remains of the Isagogika. It is found in ms. Parisinus graecus 2425 (15th century), folios 232v-237v, where it forms chapter <62> of book 6. It has been printed as CCAG vol.8 part 3, p. 111-18. Pingree gives a table of contents, and remarks on the many passages which are also found in Porphyry. The text is incomplete in this, the unique surviving manuscript. The heading in the manuscript is “book 1 of the summary of the Isagogika of Antiochus”. There are 28 chapters, the last of which is incomplete. There may have been further chapters, and clearly there should be more than one book. “Epitome II” contains the remains of the Thesaurus. It is found in ms. Florence Laurentian 28, 34 (11th century), on folios 84-93v. Some chapters cover topics from the Isagogika, but others are word for word identical with Porphyry, and one cites Paulus of Alexandria who composed the second edition of his own Isagogika in 378 AD! So this epitome is probably a work of the 5-6th century. It is printed in CCAG vol. 1, p.140-64. There are 53 chapters. A translation by Robert Schmidt (1993) is available from Project Hindsight. “Epitome IIa” is a rewriting of various chapters of epitome II, undertaken ca. 1375 by the school of John Abramius. Pingree lists five manuscripts, one of which was destroyed in the 1904 fire of the Royal Library in Turin. A further six manuscripts he lists as deteriores. So “epitome IIa” is merely an additional textual source for epitome II. The present translation bas been made from two sets of excerpts edited in the Catalogus Codicum Astrologorum Graecorum. The first set was excerpted from Rhetorius’ large compendium (no longer extant in its entirety), and Rhetorius had himself made these excerpts from a Thesaurus (or Treasury) of Antiochus. This set of excerpts was edited in Vol. I. p. 149 ff. by F. Boll. Many of the entries in this collection were apparently taken over almost verbatim by Porphyry in his Introduction to the Tetrabiblos. The second set of excerpts (from Vol. III, p. 107 ff. also edited by F. Boll) is identified as being from the same Thesaurus of Antiochus. However. the sequence of excerpts seems to be broken with apparent excerpts from another works or works inserted. Most of these insertions are attributed to Heliodorus by the modem editor. A few of the sections are of doubtful authorship. We have translated those that the editor has attributed to Antioobus with some certainty. But there is no work of Antiochus listed on p.107 of vol. 3 of the CCAG. The material he translates is in 9 chapters. And the material he lists for vol. 1 as beginning on “p. 109” in fact begins on p.108. When I have more time, I must try to reconcile these. UPDATE: The comments on this post are well worth reading. In particular Jose tells us that the “second set of excerpts” translated by Schmidt are in fact found in vol. 7 of the CCAG (not vol. 3) on pp. 107-128. Indeed they are, under the heading, Excerpta ex Antiochi thesauro et ex Heliodoro. The first set of excepts translated by Schmidt seem to be those on vol. 1 p.140-164: Rhetorii quaestiones astrologicae et Antiochi thesauris excerptae. So Schmidt is indeed translating “epitome II”. In the updates to my last post, I stumbled across a translation of Porphyry’s introduction to Ptolemy’s Tetrabiblos that included an interesting-sounding work by a certain Serapion Alexandrinus, consisting of a short explanation of terminology. A Google search brings me to this page, which gives the text of the work (from CCAG vol. 8.) plus a translation, all done by Eduardo Gramaglia. That is very useful to have! Serapio of Alexandria (of uncertain date, but probably B.C.E.). Not explicitly mentioned by Firmicus, but perhaps belonging to this period. The few surviving fragments of Serapio mostly deal with inceptional or katarchic astrology (that is, electional issues); there is one important fragment that sets out a general strategy for doing such katarchic investigations, and Serapio may have been one of the earliest systematizers of this theory. Interesting, but a bit short of detail and indications of sources. But in the RealEncyclopadie, vol. 51, cols. 1666-7, I find him as Serapion of Antioch, known to Pliny the Elder (NH ind. IV, V) and Cicero (Att. II. 4, 1). According to the RE, the list of definitions apparently tells us (p.227, l.32) that Serapion wrote in Egypt. UPDATE: The CCAG vol. 8, part 4, gives Serapionis Alexandrini excerpta on p.225, from codex 82 (i.e. Paris. gr. 2425). For Sarapion or Serapion Alexandrinus, who perhaps is the same as Serapio of Antioch, a disciple of Hipparchus, or so it would seem, who taught at Alexandria, see Boll, Byzant. Zeitschr., VIII, 1899, p.525. The work from which excerpts are presented here was indeed written at Alexandria, as appears from p.227, l. 32, where he calls the sea as subjected to Aquarius th\n kaq’ h9ma~j qa/lassan; for Egypt according to the most ancient “chorographia”, as it is called, i.e. astrology, is under the dominion of Aquarius (Vettius Valens, p.12, 15, ff, Kroll, etc). The anonymous work of 379 says that Serapion was before Ptolemy wrote about the appearance of the stars (CCAG, V, 1, p.205, l.17). Other fragments of Serapion may be found in CCAG 1, p.99, p.101; CCAG 5, 1, p.179-180; CCAG 5, 3, p.96. Not a lot; but something. A few weeks ago I wrote of my discovery that a bunch of ancient astrological texts existed in an largely unknown English translation by Robert Schmidt of Project Hindsight. These can be obtained by emailing the site and sending money by Paypal (a price list is here, but prices are actually more flexible than the flat $45 per booklet). A table of contents for each volume is on the site (e.g. Antiochus of Athens is here). These translations have remained unknown. I cannot check l’Année Philologique, but I don’t know that they have ever received an academic review. COPAC, the UK union catalogue for research libraries, did not reveal a single copy in any of them. They were originally sold on a subscription basis to interested people in the astrological community, and so did not circulate more widely. Now I’m not very interested in ancient astrological texts. The existence of astrology and astrologers in our own times is something of a curiosity. I have found those I have dealt with to be rather civilised folk, somewhat gun-shy and afraid of being taken for cranks and cultists when they write. It was important to get rid of astrology so that astronomy could be born. But since they are so harmless, we may see these people, and their interest in the astrological tradition, as a genuine survival from ancient times. It’s a part of our own day that would be thoroughly comprehensible to a Roman. It’s as if the worship of Apollo lingered in some mountain fastness; wrong, no doubt, but of great historical interest. This has led me to take an interest in the matter, and perhaps to write more than I might otherwise have done. I believe that all ancient literature should be accessible to anyone who wants to click on a link. At the very least, it should be easy for people to find out about them! 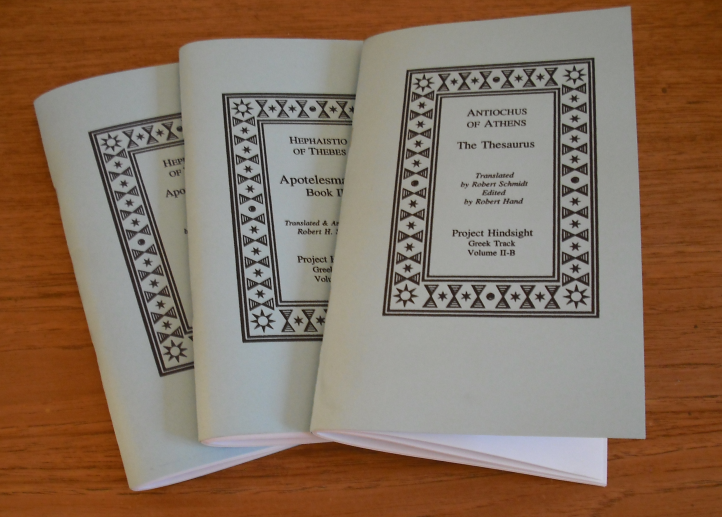 So I invested some of my own money and obtained three volumes from the series; Antiochus of Athens, The Thesaurus; and Hephaistio of Thebes, Apotelesmatics vols.1 and 2. I was warned that these were not of professional quality, that they were reprints, perhaps even photocopies, and that this was why they are not widely advertised. A package arrived this morning from the US. On opening it, I found three A5 booklets, a card cover, bound as a single-quire with two staples in the spine holding the quire together. My first impression was positive. The text is typeset professionally, the tone is calm and sensible, and the introduction by Robert Schmidt a model of professionalism. I attach a couple of photographs. You should be able to click through on these to the full-size images. Unfortunately it is rather dim here today, and I am never that handy with a camera taking images of pages anyway. The volumes, as far as book production is concerned, seem to me to be perfectly acceptable and nothing to be ashamed of. A few of the pages betray the odd mark indicating that a photocopier has been involved — the odd dust speck, the odd hair. But all of us have photocopies of that kind! The text is always perfectly clear and readable with none of the blodges that you get from photocopying old paper. The prices are rather high, it must be said at once. But you can haggle. The team at Project Hindsight have reprints on the shelf of some of the volumes, which they are willing to let go at a discount. The introduction to the Antiochus by Robert Schmidt is a model of how this should be done. He indicates his sources, he states what text he is translating, and he gives an appendix indicating how he has translated specific technical terms. The additional editorial work and notes by Robert Hand also look good. This issue of technical terminology is a real one, which must obstruct all progress in this field until a specialist lexicon is compiled. Mark Riley, while working on Vettius Valens, did start compiling such a lexicon, and he has placed his notes online. It is interesting that Robert Schmidt has found the same need, and I could wish that the Project should place online a digest of how these terms were rendered. In fact Dr Schmidt might be well advised to publish an article in some technical journal on this very subject. A number of volumes of Vettius Valens are in the Project Hindsight list. It seems that Dr Riley and Dr Schmidt worked independently, neither aware of the other. But the result is probably of benefit to everyone. 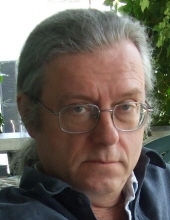 Robert Schmidt is now reworking his translations, with the benefit of 17 years experience, into a new series of hardbacks, again to be sold on subscription. We must all wish this enterprise well, and I hope that the translator reaps a handsome financial reward, for his efforts have benefitted mankind to an extraordinary degree. I wish I knew how to get some of the major libraries here to subscribe, for it is clear to me that these volumes need to be held in research libraries, and will otherwise be very hard of access. Anyone any ideas? A note from Prof. Mark Riley to say that he has fixed a few bugs in his translation of Vettius Valens, and uploaded a revised PDF here. Grab it while it’s hot! I’m getting snippets suggesting that the upload of this complete translation to the web is causing rather a stir in astrological circles. Which is all to the good, of course! I’m still thinking about parapegma, the ancient peg-calendars to predict star- and weather-movements. A google search has revealed that the opening parts of Daryn Lehoux’s 2007 book are a version of his 2000 PhD thesis, which is online at ScribD here. It’s a Canadian thesis, which leads me to wonder whether Canadian theses are online for free, and if so where? The thesis doesn’t include the texts and translations. But it doesinclude the key question, “what is a parapegma”? The general quality of writing, tho, is considerably inferior to the final version, and it is not nearly so readable. Those with a library room in their country estate, and $155 to spare, will be better advised to buy the book. We peasants, however, will still gain value from the thesis. The word parapegma (pl. : parapegmata] refers to an ancient instrument which was used to keep track of astronomical, astrological or astrometeorological cycles using a moveable peg or pegs. By extension, the word also refer to a group of texts which were derived from these instruments, and which tracked the astrometeorological cycle typically by linking it to a calendar. There were also non-inscriptional, literary parapegmata in both Greek and Latin. A typical example of these would list the dates of a coming year in, for example, the Roman or Egyptian calendar, and, for particular dates, offer astronomical and weather predictions for that year. In this respect, they are rather like a pared-down version of a more modern Farmer’s Almanac. These calendars were used in Greece from at least the fifth century B.C., and there are Western European and Byzantine examples dating well into the Middle Ages and beyond. The Romans translated Greek parapegmata into Latin, and they were developing their own versions by the first century B.C., with some interesting modifications. In particular, their inscriptional parapegmata were often used to keep track of lunar days, hebdomadal days and nundinal days. There was also a corresponding Egyptian tradition dating from at least the fourth century B.C., which may or may not be independent from the Greek. (Month of] [Thoth,] [day] 1: [at the latitude where the day is 14 1/2 hours [long], the (star) on the tail of Leo sets. According to Hipparchus , the Etesian winds stop. According to Eudoxus, rain, thunder, the Etesian winds stop. It seems therefore probable that there was only one peg which was moved each day frorn hole to hole, thus indicating only the current date, and the current astronomical or astrometeorological situation. The empty peg holes would aliow one to count the number of days between now and the next significant event. All this is extremely interesting, although an edition of the texts and translations, and ideally a corpus of inscriptions, is required to substantiate this. It seems that Lehoux realised the same, when preparing the book version. All this reminded me strongly of the calendar in the Chronography of 354, which displays the nundinal days. I never found a good account of how these worked, but the thesis contains an explanation of these too. Lehoux’s thesis is good. But it remains just a thesis. The final product, the book, is infinitely better. I just wish I could afford to buy a copy! Books like this one are a real blessing. This is a book that takes a field in which there is only scholarship in German — and English-speaking scholars do not, on the whole, display much in the way of German language skills — and makes the whole subject accessible to English speakers, places it in context, and deals with questions of the kind that I have struggled with, while working on Antiochus. It’s like a travel handbook to a new and totally unfamiliar country. But once he has this, the interested reader will be able to locate the major cities, find a hotel, and know which sites to visit! Ms. Vaticanus Graecus 1056 (V) is a paper manuscript of the 14th century. The main content is three books of a five-book collection of Greek and Arabic-Persian astrological materials, apparently compiled in the Byzantine period. The manuscript is described in detail in the Catalogus codicum astrologicorum graecorum (=CCAG), vol. 5, part 3, p.7-64, and also by Boll in his Sphaera, p.34. In the first book, on folio 29, is the calendar or parapegma of Antiochus. Unlike the other manuscripts, the calendar here begins in March. Ms. Munich Graecus 287 (M) is a manuscript of the late 14th or early 15th century. There is a detailed description in CCAG vol. 7, pp.8-24. The calendar appears on fol. 127v-132v. Closely related to the Munich ms. is Ms. Modena Graecus 85, belonging to the Biblioteca Estense (III C 6). This is also known as the Mutinensis. It was written at the end of the 15th century by a scribe named Michael Suliardus, and was later in the possession of George Valla. See also CCAG 4, 28-33, and Boll’s Sphaera p.53 f. The calendar is on folios 69-74v. Franz Boll, publishing the text, gives the opinion that it is either a copy of the Munich ms., or else derived from a common exemplar, in which case, he feels, it can be disregarded. In the latter case, of course, it could well contain some truth not found in its brother ms. so Boll is in error here. He prints a facsimile of two pages from it, tho, because the drawings are clearer, and the Modena ms. is also less well known. The next manuscript is in Oxford, one of the Selden mss. (number 16) in the Bodleian library, and is described in Coxe, Catalogi codd. mss. bibliothecae Bodlianae vol. 1, p.593 f.. Boll gave it the siglum O. It dates from the 15th century. The calendar is on folios 147-149. It is quite unrelated to any of the preceding manuscripts. On f.145 are extracts which are labelled here and in other manuscripts as from the Thesaurus (=Treasury) of Antiochus of Athens. Following the calendar are further extracts again labelled here and elsewhere as by Antiochus. Ms. Cambridge, Trinity College, O 7, 39, pars III, is a copy of the Oxford manuscript made in the 17th century, probably by Edward Bernard for Thomas Gale (see M.R.James, The western mss in Trinity College, Cambridge, III 375). The only deviations from O are obvious typos. Vienna ms. philos. gr. 179, was brought from Constantinople. It is 14-15th century, and from folio 41 onwards contains excerpts from Antiochus. It is described in Kroll, Beschriebung Catal. VI. 28f., and also by Boll in his Sphaera p.52f. Unfortunately there are pages missing from this section of the manuscript, but a title is given in the list of chapters, indicating that it was present. Boll therefore edited the text from the three independent mss, M, V and O. He found the text was better preserved in V and O, than in M.
In V and M, and the related Modena ms., the text is anonymous. Only in the Oxford ms. does the name of Antiochus appear. But the calender is just one chapter in O, sandwiched between other chapters under the name of Antiochus. Some of those chapters are also in M, but again no author name appears.But we know that O is correct, for there are other astrological manuscripts which also contain these non-calendar chapters, and identify the author as Antiochus. So we have to accept that the loss of the author’s name in M is merely an accident of transmission. The same is true in the Vatican ms. Boll concludes that we can reasonably suppose Antiochus to be the author, that an ancient tradition attaches his name to the text, but that when V and M were compiled, the name of Antiochus was omitted for some now unknown reason. No biographical information has reached us about Antiochus himself, but he is one of the better known ancient astrologers, because of those who refer to him. Porphyry, in his Isagoge of Ptolemy’s Tetrabiblos, quotes him; Hephaistio of Thebes, in book 2, chapter 1, tells us he was from Athens, quoting some of the same material word for word. Firmicus Maternus (II, 29) mentions him. The Arab Massala (Catal. I 82) tells us that he wrote in seven books, together with the titles of two works, περι γενεθλίων and περι ερωτήσεων. He is also listed in the anonymous writer of the year 379 AD, in the consulate of Olybrius and Ausonius, in a list of older writers, between Valens (2nd century) and Antigonus of Nicaea (2-3rd century). Antiochus makes use of the data of Ptolemy (early 2nd century). Boll therefore dates him to around 200 AD, “unless some unexamined Paris or Vatican astrological manuscript” should contain more information about him. All this may seem rather dry. But it is worth remembering that, for many or most writers of antiquity, this sifting of slight facts is how we gain knowledge. We are so accustomed to the Pliny’s and Vergil’s and Tacitus’ — even to the point at which people get revisionist about this work or that — that it is salutary to be reminded by what little threads we receive much of what we know.